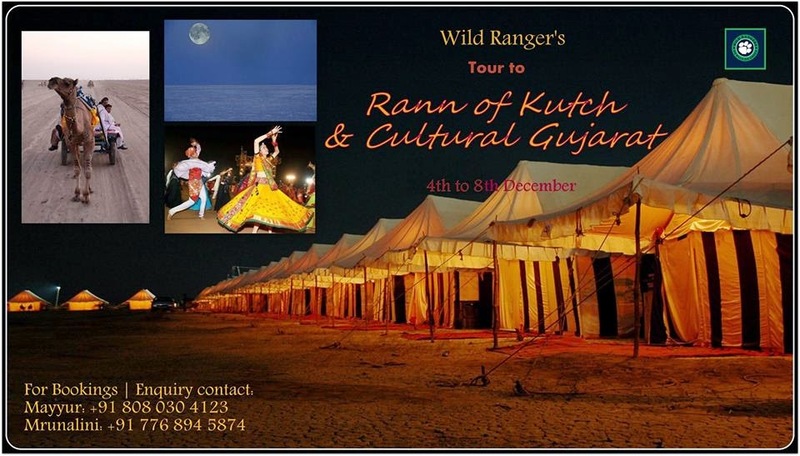 Wild Rangers has arranged a tour to Gujarat’s Katch Utsav or Rann of Kutch. The Great Rann of Kutch is the world’s largest salt desert spreading across India and Pakistan and is a remarkable journey to be undertaken during the majestic Rann Utsav that happens in December, each year. Measuring over 16,000 square kilometers, the vastness of the Salt Desert is worth setting on the road for. Rann of Kutch is a place once visited is hard to forget where the White sand extends till horizon. unique experience in terms of sight, terrain and geography. Drive down to our accommodation in Rann. Freshenup. Explore North Katch. Thaan Monastery. Traditional Rogan Art at Nirona Village. After a day of exploration, we’ll leave for Dhordo to witness the magical sunsets in the White Rann, indulge into some cultural programmes of the Rann Utsav, have traditional Kutchi Dinner and return for our stay. Visit to the highest point in Kutch, Kala Dungar. Visit south Kutch – Mandvi town and bazaar, ship building yard, ship model making workshop, Shyamji Krushna Verma memorial, Vijay Vilas Palace and the beautiful Mandvi Beach for sunset. Visit Bhuj – Kutch museum, Pragmahal, Aina Mahal, Bhuj bazaar and Bhuj haat, Bhujodi weaving village, Hira Laxmi Memorial Craft Park and indulge into some great handicrafts shopping. After Dinner, we’ll catch a return train for Mumbai. Registration and Payment Details: For registration transfer advance payment of INR 9000.00 in the account details mentioned below. Or mail us info@wildrangers.in . The Balance amount must be transferred before 15 days of the event. 1. If cancellation done prior to 25 days of outing 75% will be refunded. (a) All our events are Eco-friendly, kindly take care of nature around us. Respect the Heritage and culture. (b) Do Not Litter, Participants are requested to carry the waste back to the city and dispose it off in dustbins. (c) Leader’s decision will be final and binding on all members. (d) Group discounts(5%) available on booking of minimum 4 participants. (e) Customization available with dates and schedule as per requirements for minimum booking of 6.